214 pages | 33 B/W Illus. In a very understandable, practical, and accessible manner, this book applies recent groundbreaking findings from behavioral neuroscience to the most complex and vexing challenges in organizations today. In particular, it addresses managing large-scale organizational changes, such as mergers and acquisitions, providing lessons and tactics that can be usefully applied to in many different settings. In addition to discussing successful practices, it also identifies the reasons that most past comprehensive, long-term change projects have failed and unmasks the counterproductive effects of the typical evolutionary or emotion-based attempts to change group and individual behavior, using neuroscience as its principal tool. "Large-scale change is a frequent reality in contemporary organizations. Such change is typically complex and stressful for participants, rarely fully achieves its goals, and all too often can be evaluated as a failure. That track record has led to many books that purport to provide THE ANSWER to successful organizational change, but most are only rehashes of simple ideas intermixed with a few ‘war stories’ from the authors. Rob Snyder has written a very different book. In a style that engages the reader, Dr. Snyder presents an excellent summary of recent research in social cognitive neuroscience and carefully describes the implications and application of these findings to how organizational change efforts should be led and managed. This innovative approach challenges many widely-held beliefs about human motivation and behavior and builds a solid case for following the change principles that are offered. It is a valuable book for the newcomer and veteran, the academic and practitioner, and the change agent and general manager." "TiER1’s approach to changing the performance of people sets them apart from the competition and it shows in their results. This books explains why." 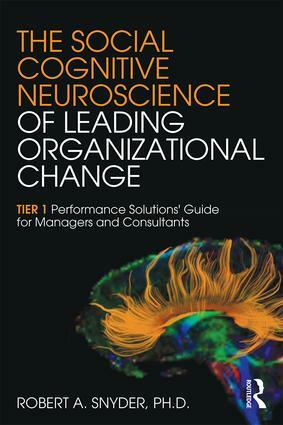 "In this excellent book, Rob Snyder summarizes and explains the fast-developing research field of Social Cognitive Neuroscience and applies its findings to the many challenges of leading large-scale organizational changes. I think much of current management theory will have to be revised because of this new thinking coming from neuroscience. I recommend that both practicing managers and academics read this book as an introduction to many new ideas. It uses straightforward language and clear examples to help readers understand some very non-intuitive results." -Joe Seltzer, Professor of Management, LaSalle University. President, OBTS: Teaching Society for Management Educators. "This guide is a treasure trove of information that's easily accessible to anyone facing the challenges of managing change. Unlike so many other books on the subject, it focuses primarily on the underpinnings of what the behavioral sciences and most recently, neuroscience, have taught us about how people experience, react to and ultimately deal with change. Most of all, it establishes a comprehensive, contemporary and defensible standard in how to manage the changes so common among organizations today. It debunks some old myths that have been around for a long time and provides great new insights that are counterintuitive. No matter what you think you know about managing change, this book has something to teach you." "Leading and embracing change is the new currency in today’s business environment and the competitive differentiator in becoming a sustainable and relevant high performing organization. The practical insights provided in this wonderful book provide a north star compass to continued success." -Tim Massa, Chief Human Resources and Labor Relations Officer, The Kroger Co.
Robert A. Snyder holds a Ph.D. in Organizational Psychology from the University of Maryland and is Professor of Management in the Haile/U.S. Bank College of Business at Northern Kentucky University. Over the last 40 years, he has consulted on performance improvement and learning effectiveness issues with over 100 private and public sector organizations. Dr. Snyder is the winner of the 2016 Michael A. and Elizabeth Ruane National Prize for Innovation in Business Education Writing. He also received The 2015 Fritz Roethlisberger Memorial Award for his writing in The Journal of Management Education.